Hab neue Tombows bekommen und habe sie ausprobiert an der PB-Katze. Wobei ich sie nur teils benutzt habe, das andere sind Aquarellstifte...ich leg mir grad erst ein Sortiment an Tombows und ähnlichem zu und hab da noch lange nicht alles*g.
For long time now I have crafted a non-x-mas card this evening*g. I've got some new tombows today and I wanted to try them out. Surly the card is not colored totally with tombows, I also used aquarell colors because I only am on my way to buy me more and more tombows and such things. But I do not have at all all colors so far. This cute Penny Black cat is just fine for 2 challenges this week: At the Penny Black Saturday Challenge theme of the week is *Monochromatic* und at the Sketch Saturday there is the sketch below this week. oh so cute, love your choice of colours and great take on the sketch. 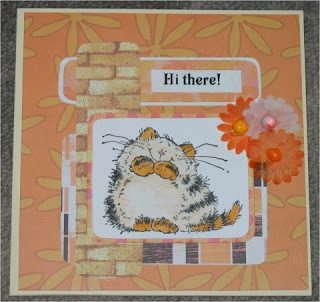 Lovely card and great colours!